This 5 ml bottle with stainless steel blunt needle tip delivers a precise amount of liquid for various cosmetic applications including aromatherapy oils, liquid glitter, liquid makeup, tattoo artist ink and even fountain pen ink cartridges. Also, ideal for injecting or dispensing e-liquid oil into tanks and cartomizers accurately and cleanly. The rubber attachment ring closure covers the blunt needle tip and helps to prevent spills. Clear Dropper Bottle with White Screw-Top and Blunt Needle Tip - 5 mL. - 0.17 oz. 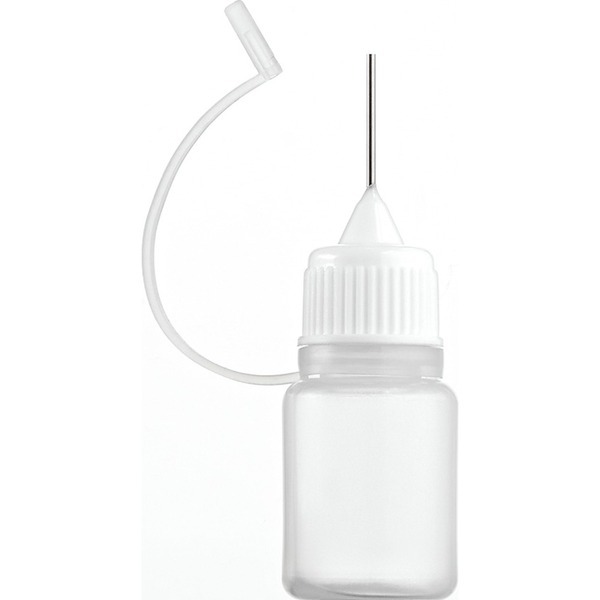 Clear Dropper Bottle with White Screw-Top and Blunt Needle Tip - 10 mL. - 0.33 oz.